Tis the season, as they say. Sleighbells ring, jingle bells, deck the halls, Santa Claus, and all of that stuff. And the long, dark nights of the year. I’m excited because soon the winter solstice will be upon us and we can celebrate the return of the sun. I’m slighly pagan at this time of year, in spite of my traditional Christian upbringing. The downside to all this festivity is the decorating. Yes, I certainly DO enjoy beautiful holiday decor, and I enjoy all the pretty lights this time of year. I even smile at the pitiful rooftop santas. But it’s hard to bring a smile to my lips as I’m faced with the sheer number of boxes of Christmas crap that are stored in my attic. I took down 15 boxes of Christmas stuff, collected over the 30 or so years of marriage and two children who loved crafts. I felt like the beast of burden who carried Mary, heavy with child, as I carried each heavy box down the attic stairs and deposited it on the family room floor. At least the donkey could deposit Mary and then rest. At least Mary had Jesus to look forward to after her labors. All I had at the end of my labor was a big mess. And a determination to get rid of half of this stuff. “Are you getting rid of all your cute little Christmas Village houses?” my neighbor asked. “I don’t know.”, I said. I say this when I am afraid to commit myself to dumping things that I can still visualize being ‘cute’ when set up a certain way. But the ancient and frightening stuffed vintage Santa? Out! The victorian house cookie jar? Gone. I’ve never used a cookie jar in my life. Cookies don’t last long enough in my house to warrant a jar. Any cookie that is going to last that long has to be stuffed into the back of the freezer in a ziploc bag. Also gone is an entire box of ornaments that I’ve always kept because I bought them when the kids were small, along with a box of ornaments I used when Andrew was too little to be trusted close to a tree with breakable ornaments. I haven’t used them in years, but I always felt like I had to keep them. I’ve decided that rule is silly. Instead I’ve created a small box for each child to store the precious things they made over the years. Claire’s box will have her little stuffed santa, and the pinecone wise men and wizards. Andrew’s box will have his little clay candle holder, his styrofoam heart with smelly potpourri glued to the outside, and his salt dough dinosaurs in fancy colors. Those boxes will also contain all of the ornaments I’ve bought the kids over the years so that they would have a box to take with them when they have their own homes. We’ve had a tradition in our family that on Christmas eve each child receives an ornament and a new pair of pajamas. We allowed them to open these two gifts by way of bribing them to sleep late on Christmas morning. Now that they are 19 and 26, I feel sure I can forgo the buying of more ornaments that will mean more to me than to them. I might still consider pajamas, though. Among the things I’m keeping is my collection of miniature ornaments. I always look forward to these each year. They are made by Hallmark, and I used to buy them every year. I think I can find a place on a sailboat for these little ornaments so that we can have an actual Christmas tree, no matter where we are in the world. I didn’t even consider getting rid of any of them. The results of my labors are such that I will have maybe 3 or 4 boxes of actual ornaments to go into the attic at the end of the season. Half of my Victorian village made the cut, so I get to have my cake and eat it, too, on that subject. If it’s too much of a pain to set them up and pack them away this year, then they’ll go after the holidays. In all, a fairly rewarding purge, and almost painless. Update on the furniture situation: thank God for sisters! Between my two sisters, over the Thanksgiving weekend I parted with two chairs, a cabinet, a rug, a desk, a set of china, a silver tea service, and various other bits and pieces, enabling me to move even more stuff into the garage staging area. The great purge continues! This entry was posted in Clutter, Downshifting, Organizing and tagged clearing the clutter, Clutter, Downshifting, Downsizing, Getting Organized, Great Purging, Mid-life, Organizing by Melissa. Bookmark the permalink. 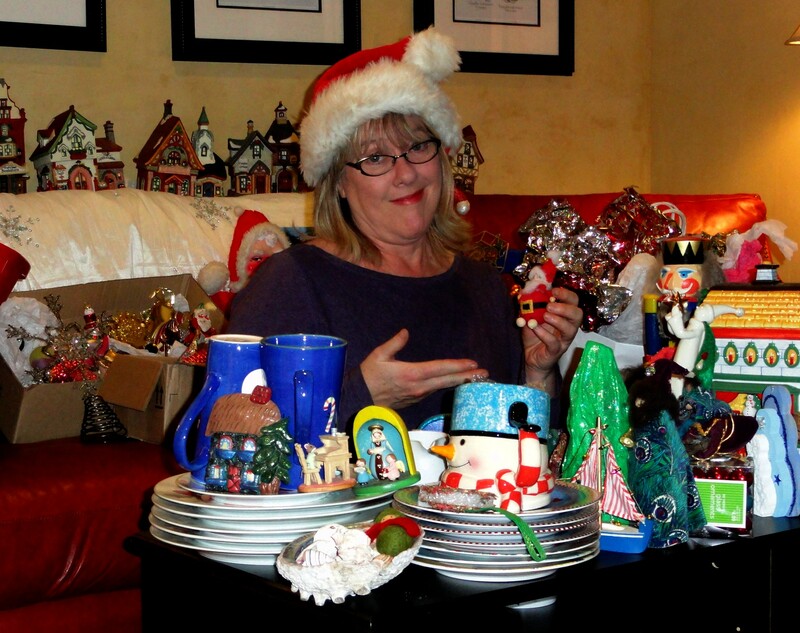 Ah yes… the Christmas decoration purge. I have yet to face that one as all of mine are in a friends crawl space. Not as much as you had – I have maybe 4 boxes and a tall rubbermaid – but still going to be hard to do. I collect snow men. I must have 50 of various sizes. I also used to collect Hallmark decorations. I KNOW my kids want those. 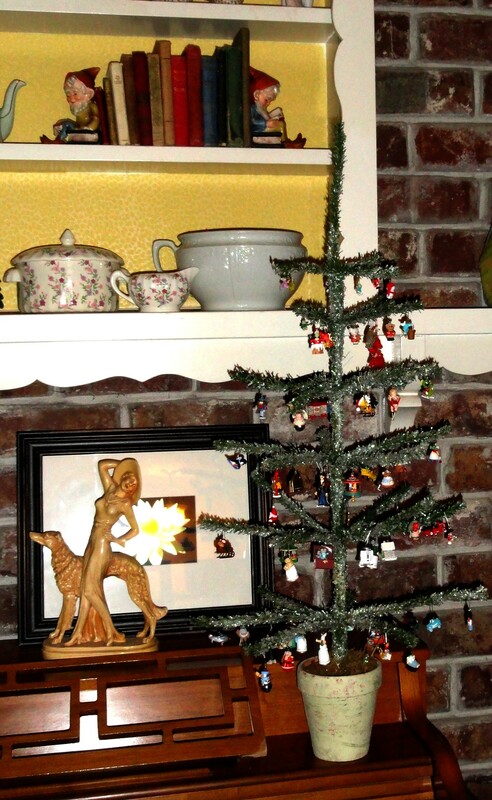 I did get rid of my 7′ pre-lit Christmas tree – oh how I loved that tree. It’s all a painful but ultimately rewarding process – not unlike plastic surgery!! Oh, and I did the ornament a year thing for each of my kids… such a great idea. The girls love theirs. My son, not so much. Boys!!! Yes, I did the Hallmark ornaments thing for the kids. I think the boy will like them better when he’s older. He appreciates them now, but you know how it is at age 19. Your comment about plastic surgery had me chuckling! I can only hope this process benefits me that much! I admit, it does feel good to toss things out. Wow, that’s a ton of christmas stuff. I bet it feels good to be free from most of it. It totally does! Now I can look forward to getting the decorations down because it won’t be such a head ache. The wierd thing is that although I have fewer decorations, I will probably actually decorate MORE! Who knew? Good job on the purging, girl! It’s tough but not as tough as trying to fit all those Christmas decorations on the boat! I cannot even imagine! If I need ornaments on the boat, I will always have my collection of miniatures. They fit in a sandwich sized ziploc bag! I think I can find room for that!